I love the character Moon Knight. An alter-ego of Marc Spector (along with Steven Grant and Jake Lockely), when he is written well it can result in some stellar stories. When he is written poorly it can be pretty lame. Right now Max Bemis is writing the comic with Jacen Burrows on art, and sadly the comic is really letting me down. First off, let me say that Jacen Burrows is supplying amazing artwork and should only receive praise for how great a job he is doing illustrating the current, "Moon Knight," comic. His drawing is as crisp, clear, and high-quality as ever. In other words, Bemis basically gets the full blame for this comic really being mediocre. It started-out pretty strong, with the debut issue #188 (yeah, Marvel's stupid Legacy renumbering is a pain), but has gone downhill from there. The comic seemed like it might be clever and moody, but then it just started doing weird little jokes, confusing plot-points, and otherwise just feels...off. When I see Spector's arch-nemesis of Bushman I expect to be scared, not find him like comic-relief. The random introduction of Spector having a child with his longtime flame Marlene that he doesn't know about because it was his Jake Lockely side is just a weird plot twist as well that doesn't jell with how the concept of Spector, "Being," different people usually goes. 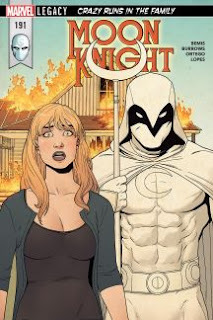 It just all feels like a bad first draft of a, "Moon Knight," comic with some good bits but a whole lot of terrible stuff too. The badly-hurt villain called himself, "The Truth," so I guess that's a pun...yah? I know some people are enjoying Bemis' work on the book and I've liked stuff I've read by him before too ("Oh Killstrike," was stellar). I just would rather be reading something at the quality-level of the old Moench stuff, the decade-ago Huston stuff, or the really recent and great Warren Ellis stuff than what we are getting right now. At least the artwork is great.